I came to Tweedsmuir in search of bears. I would have been happy just getting a glimpse of one. Seeing five different bears in my first twenty minutes at the Belarko Bear Viewing Platform was one of the most incredible experiences of my life and was certainly unexpected. By the end of my visit to Tweedsmuir it shouldn’t have surprised me that I saw so many bears. Tweedsmuir is a place of superlatives. A mountain named ‘Stupendous’, a waterfall with the highest single drop in Canada, and an icefield so large that it has been dubbed the Monarch Icefields. If there was ever a single park that represented the province of British Columbia it might be Tweedsmuir. This could be explained by is sheer size. Tweedsmuir is the largest provincial park in B.C., spanning the dry interior forest of the Chilcotin Plateau, volcanic mountains, stark glacial landscapes, lake chains, and temperate rainforests. September is an excellent time to visit Tweedsmuir. 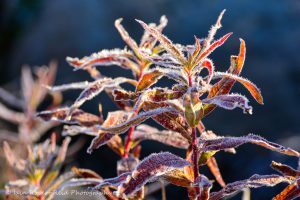 The rivers are full of salmon, wildlife comes down to the valleys to partake in the feast, the alpine explodes into yellows, oranges, and reds, and frost glistens in the early morning. It feels as if the salmon run brings everything together, including the local people. 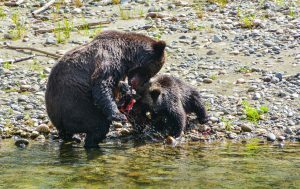 I had one especially memorable moment watching a grizzly sow and cub fishing along the Atnarko River. 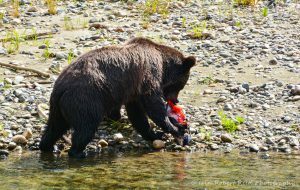 The sow had caught a nicely sized salmon and started gorging on its roe. Like any hungry child, the cub wanted a bite too. 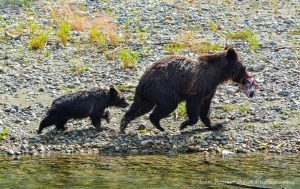 I think mom must have been particularly hungry this day as she picked up the salmon and ran away with it with her cub chasing after. They ran into the forest and I could clearly make out the cub bawling for many minutes after the incident. 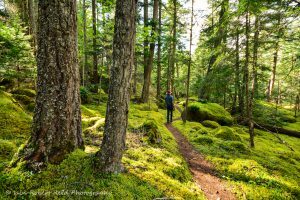 Tweedsmuir’s mossy valley- bottom forests are an incredible sight. Fed for hundreds of years by decomposing salmon and untouched by logging, these forests have a primeval feeling. A thick layer of moss carpets the ground, Douglas-firs and Western Redcedars tower above, and one may come across trees used by local First Nations, known as culturally modified trees. On the Kettle Pond trail one can find magnificent forests like these. All in all, Tweedsmuir is a park I would definitely return to. One could spend an entire lifetime exploring the area and its diverse recreational opportunities. Thank you for your blog – this draws me to look further to visiting Tweedsmuir Park n smaller townes in the area . . . ‘Buy n spend Local’ . . . Best wishes for 2018 . . .
Hi Scot, thanks for the kind message. We’re glad you’re excited to visit Tweedsmuir Park. Be sure to share your photos with us on social media. The BC Parks Visitor Services Team.